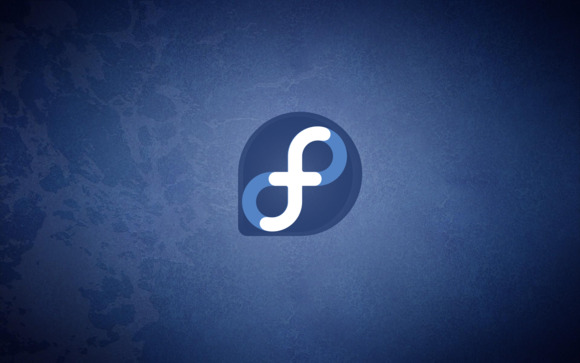 The Fedora community created one of the smoothest Linux Installation experiences ever. When I got the heads-up that Red Hat was readying the release of Fedora 25, it caught my attention like any new release of a major Linux distribution would. But I was in for a pleasant surprise when I went to download a copy of the image. 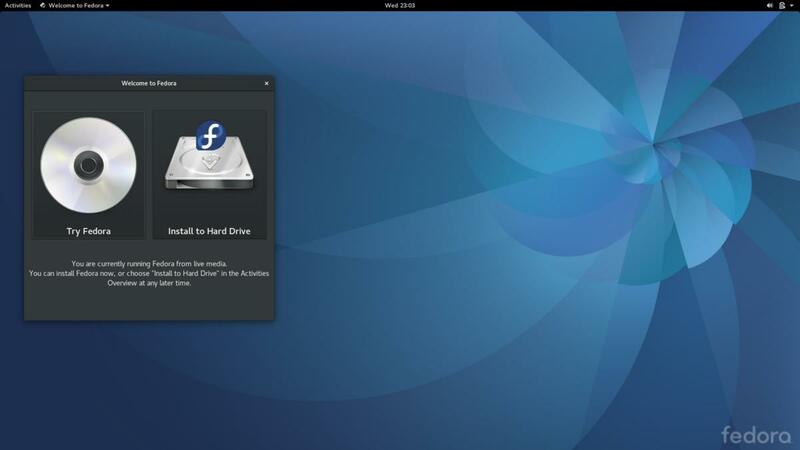 The Fedora 25 desktop running GNOMe's Software and Nautilus applications. Visiting the Fedora website from my Windows 10 desktop, I was was offered an .exe installer to download instead of the customary ISO I’ve come to expect. The Windows executable is actually a Nullsoft installer that installs the Fedora Media Writer, which is a lot like UNetbootin, but much, much nicer. After installing it, I plugged in a spare USB drive, and fired up the creation tool. What I got was something beautiful. Fedora’s Media Writer offers a clean interface where you can choose to download and install any of the major Fedora spins (which are analogous to the different flavors of Ubuntu). The great thing is that once you choose your image, and USB destination, the Writer gets right to the download. I was particularly struck by the little checkbox below the progress bar. If you enable this option, Fedora will write the image without any further input. That means with just three (or four) clicks, the Media Writer will download a Fedora image, run a checksum to verify integrity, write the image to a USB drive, and run a checksum on the USB drive. No choosing partition tables, no worrying about boot flags, nothing. It’s really as easy as it gets. Fedora’s Media Writer utility is a thing of beauty, and can run on Windows or Mac OS. What’s even better is that if you want to install Ubuntu, Mint, Arch, or any other distro, you can choose an ISO for use the Media Writer to use. The only bump I hit when trying to boot to the USB drive on the Dell Inspiron 7000 series notebook I used to test the OS was that I had to open up the BIOS and make sure the USB drive was the first boot device. While that’s trivial for any user with intermediate knowledge of PCs, it can be a bit nerve-wracking for a newbie. Booting into the live environment, I was greeted with the familiar GNOME 3.22 desktop. My daily driver is my Arch laptop running GNOME, so I'm already acquainted with this version. 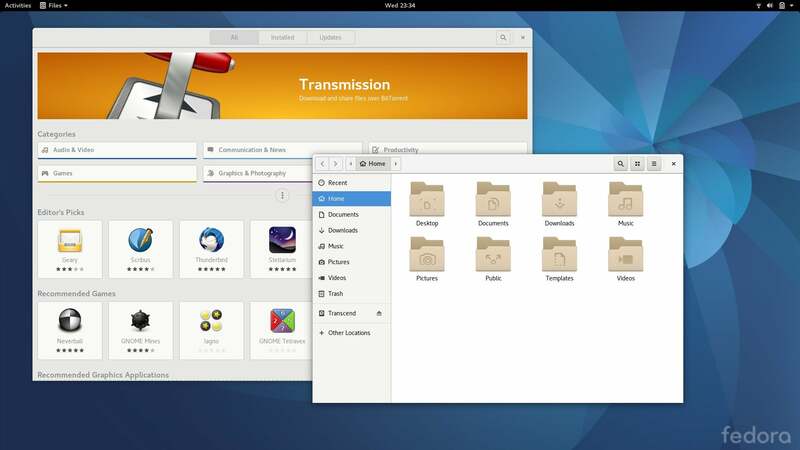 However, if you use Fedora or Ubuntu GNOME—both of which have a versioned release cycle—the upgrade to the newest version of GNOME may be the biggest draw. 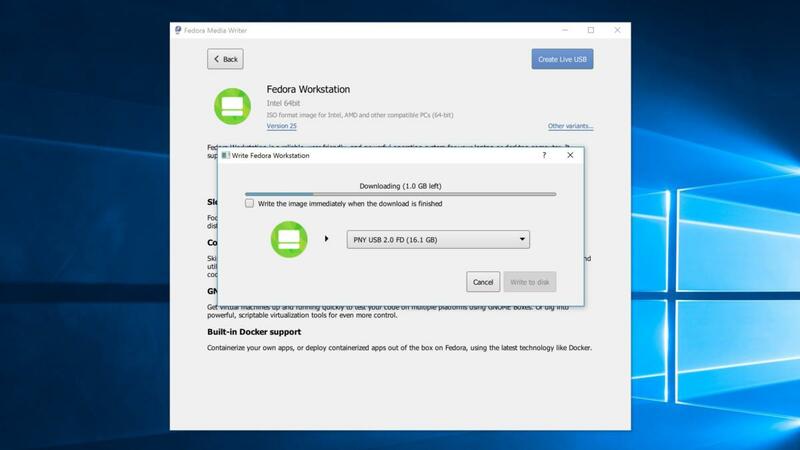 Like other Linux live USB images, Fedora 25 gives you the chance to try before you install. I was also pleased to find that Fedora 25 runs the SELinux (Security Enhanced Linux) kernel by default. 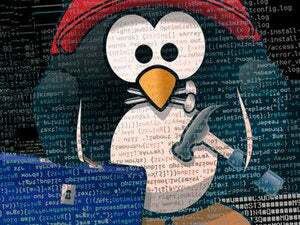 While there aren’t as many noticeable changes to the average desktop user, SELinux helps keep malware or potentially malicious code in check. Performing the bare-metal installation from the live image was simple, and might I say, enjoyable. Because I’m an Arch user, I’ve grown accustomed to diving into documentation and typing commands into a shell for hours on end. Fedora’s installer felt like a vacation by comparison. After you set your language and locale, and set up the storage, the installer starts installing packages for you. While packages install in the background, you can set the root password and add users so you’ll have a bootable system ready by the time the package installations are done. Nice. Create users while the system installs the base system packages? Don’t mind if I do. 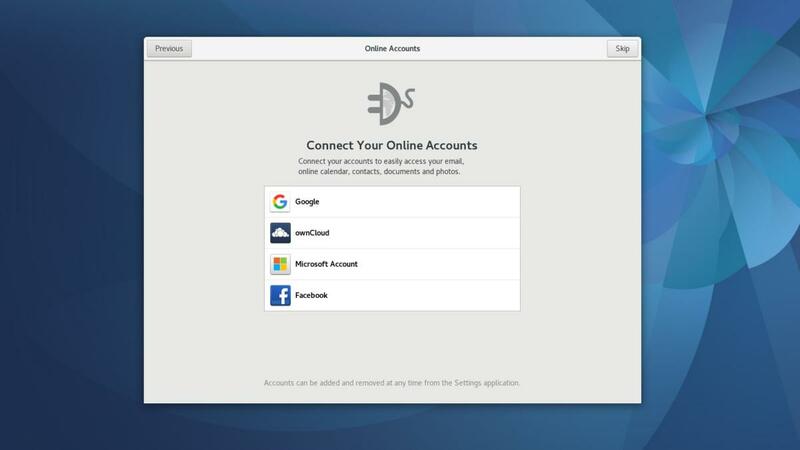 In the new system, the first login to GNOME presents you with the Online Accounts wizard, where you can enter login credentials for your Google, Facebook, and Microsoft accounts. By entering details here, GNOME can automatically set up your calendar, photos, and email. Fedora 25 comes with the standard suite of GNOME applications for GNOME 3.22, and includes Firefox 49 for a web browser. Fedora chose to stick with GNOME’s Evolution email client, so Thunderbird is omitted from the base installation. The base install also comes with LibreOffice (over AbiWord and Gnumeric), so you can start writing documents right away. The launch of GNOME’s Online Accounts app on the first login makes it easy to get up and running in no time. One thing to note is that the OS will run Wayland instead of good old X11 by default. For most users, the change is a big plus. However, if you plan on running Fedora 25 on a laptop with a hi-DPI display, running Wayland can cause some apps (like LibreOffice or Skype) to draw their windows and elements incorrectly, resulting is tiny text or icons. If this happens you can always tell GNOME to use X11 by clicking the cog wheel next to the text input box when you log in. I really enjoyed my afternoon playing with the new Fedora on my Dell Inspiron testing laptop—mostly because it took so little time to install. Since I prefer GNOME to Ubuntu’s Unity, it was a bonus that the easy installation resulted in Ubuntu 16.04 being supplanted by Fedora 25 on my laptop. Fedora 25 is built for an amazing GNOME experience, but like any Linux distribution, you can choose a flavor that comes with your preferred desktop, or install whatever desktop you want. One place fedora is a slight disadvantage is in the software download department. While most applications you’ll use will come from Fedora’s repositories, there are some applications (like Chrome) that require you to go fetch a package online or use a third-party repository. In instances where proprietary software is offered online, I still feel that Ubuntu .deb packages are more common than .rpm packages. Again, the majority of the software you’ll use will likely come from the Fedora repo, so that’s only an issue for a small subset of software. One of the principal arguments I hear about Linux's inaccessibility for average desktop users is that it’s hard to set up. Fedora 25 definitely attacks that problem head on. The experience is smooth and pleasant from download to first boot, which is why I’ll be recommending Fedora over Ubuntu for newbies and novices.